WAR AND PEACE: seeing the words can turn a stomach. 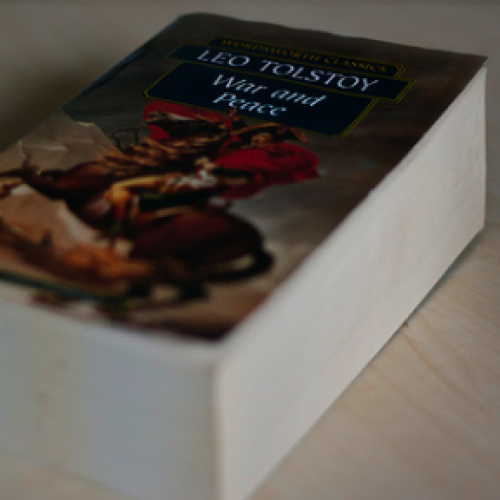 Around 1,400 pages in length (in English, about 560,000 words), Tolstoy’s epic is the epitome of the terrifyingly long novel. Dozens of characters, interwoven plot-lines, and sheer magnitude create a deep and dizzying enterprise. Does its heft often deter present-day readers? I hope not, but I fear otherwise. Bleak House, Les Miserables, and Anna Karenina have shared a similar fate. Enormity, a selling point for nearly any other American commodity, is often a detriment to the novel. Many great novels, after all, are the perfect length for their own purposes—Jane Eyre, or The Great Gatsby—but don’t we always finish them wanting more? It seemed for a time that the long novel had fallen out of favor, despite Infinite Jest and A Suitable Boy and William T. Vollman’s tomes. In a society that prefers to snack on information rather than dine on knowledge, the long novel is all too often shoved aside for its more digestible counterparts. But the good news is that the heavy literary lift has not been entirely forgotten. First published in Danish in 2006, and recently translated into English, We, the Drowned is precisely what the long contemporary novel ought to be. Epic in length and scope, it wanders to exceptional depth and breadth. It is a generational saga, a swashbuckling sailor’s tale, and the account of a small town coming into modernity—both Melville and Steinbeck might have been pleased to read it. The story of the small shipping town of Marstal, set between the Danish-Prussian wars and World War II, We, the Drowned is a eulogy for a bygone way of life and a timeless account of human suffering and pleasure. It is the story of Laurids Madsen, a sailor in the first Danish-Prussian war, who is blast into heaven during battle and returns to earth (thanks to his hefty boots and a dose of Jensen’s magical realism). It is the tale of Laurids’s son Albert, who sails the world to far-flung locales like Hudson Bay and the recently colonized Hobart Town; discovers the shrunken head of Captain James Cook; inadvertently finds himself involved in the slave trade; and foresees the demise of Marstal in a series of vivid dreams. It is also the story of Knud Erik, who is taken under Albert’s wing as a young boy, and returns home to Marstal, bedraggled and shell-shocked, after World War II. These three men and their stories form the backbone of this vast book. Laurids is on the scene most briefly—he is a grown man on page one, a physically and psychologically imposing figure whose flight from Denmark and subsequent life as a “native” colors Albert’s entire upbringing. On the other hand, Albert’s life, from his schoolboy misdeeds to his memorable death, forms the core of the novel. Knud is hoisted upon Albert as a sort of ward, ultimately ingratiating the old man and softening his otherwise curmudgeonly manner. Like any great ensemble cast, the three men are highly entertaining on their own and utterly enthralling together. Moving from youth to adulthood, Laurids, Albert, and Knud encounter the usual pains of life in a small town, but Jensen’s engaging prose and startling ingenuity here enliven the somewhat fatigued genre of the Bildungsroman. The mischief of young boys and the trials of poverty are rendered sweet and moving in such capable hands. Town pariahs and local legends are so colorfully described that, despite my own predilection for more “feminine” plots, I found myself happily enmeshed in the rough and tumble world of young boys and their misdeeds. The customary “No Girls Allowed” sign on the tree-house door has been ripped down. Appealingly, none of the three male protagonists are victims of the traditional soldier stereotypes—living only through their military exploits. Their adventures on the South Seas and their efforts in the face of Nazism do not supersede the richness and depth of their characters. Neither Albert nor Knud relish the violence in which they take part, and all three morally and emotionally suffer in the aftermath of their duties. We, the Drowned is, more than anything, a grand mythology of violence—a genrational saga in more than familial matters. Violence (and victimization) are engrained aspects of masculinity for Marstalers, but not aspects that should be taken lightly or emotionally elided. Jensen’s battles evoke awe and repulsion: the book re-sensitizes us to such horrors. Scenes of peace, too, are flamboyantly painted. In its large, miraculous gestures, Jensen’s quiet and tight braiding of the mysterious and the mundane opens an entirely new conversation about what magical realism can do. Like Garcia Marquez, he crafts occurrences of seemingly impossible proportions, but with wildly disparate motives; whereas Marquez seeks to awe and to mystify, Jensen puts the fantastic just inside our grasp. Marquez’s famous yellow butterflies, the constant companions of Mauricio Babilonia in One Hundred Years of Solitude, are magnificent and impressive, an unexplained but resonant presence, with elegance and mystery; but the origins of Jensen’s butterflies is more homely and pragmatic: “a storm, raging far away...must have swept them off an island and out to sea. They must have been seeking land—and thought they’d found it on our doomed ship.” Marquez’s butterflies float above the scene, a gentle entity, while Marsten’s “living, breathing mass of exhausted insects” settle on everything, “unable to distinguish between wood, rope, canvas, and human skin.” The deck of the ship becomes “covered with a sticky mess of trampled and drowned butterflies” after they “stuck their tiny proboscises” over every inch of the sailors’ skin. Jensen bravely elected to narrate We, the Drowned in the first-person plural, and the power of his novel is owed also to this ambiguous but omniscient narrator. The first-person plural is a rarely used narrative voice (it found success in Jeffrey Eugenides’s The Virgin Suicides and Joshua Ferris’s And Then We Came to the End, and perhaps most famously, in Faulkner’s A Rose for Emily), but never has it had such pointedly haunting effect. Jensen’s narrators alternately, but never definitively, reflect the points-of-view of the townspeople of Marstal: sailors, wives, old curmudgeons, young children. His “we” is rather like the chorus of Greek tragedy—homogeneous and boundless, sometimes judging and always interpreting. The “we” of We, the Drowned is a haunting voice—a whole society, in unison, made manifest. It must be said that Jensen’s heavy reliance on sea metaphors grows tiresome—too many compass analogies. And he tends to go overboard (sorry) with his protagonists’ moralizing tendencies. Most gallingly, female characters are few and far between—perhaps he learned a bit too much from his predecessor Melville. It is true that women were not a part of the seafaring life; and as many of his characters proclaim, they are the lighthouses on the beach, beacons to call men home—secondary characters in the lives of men at sea. It might have been peculiar to ascribe to women dominant parts in such a tale—the novel, as a portrait of a world, is hobbled by their absence. But I find the sins of this book very easy to forgive. Of its kind, it is really exemplary. Hillary Kelly is the assistant editor of The Book.